For centuries, most Christian churches have accepted St. Paul’s teachings on the meaning behind Jesus’ crucifixion. 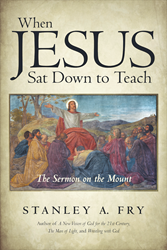 Retired pastor Stanley Fry has found a powerful alternative meaning through the teachings of Jesus. After extensive research, Fry wrote When Jesus Sat Down to Teach in an attempt to end the dissonance Christians find among St. Paul’s explanations. Fry pays close attention to the teachings Jesus provided in the Gospels, according to the “Q” theories. The “Q” theories are a hypothetical written collection of Jesus’ sayings found in the Gospels of Mathew and Luke. From these teachings, Fry focuses on the eight Beatitudes and how they should fit into each individual’s life, with the focal point on the need for equality within society. Early in his career, Fry spent five years in Brazil acting as pastor to two rural churches. When he returned to the United States he furthered his religious education and spent the duration of his career as a pastor. Fry delved into Jesus’ teachings and wrote When Jesus Sat Down to Teach after retiring, but his writing still reflected his time as a pastor. Stanley Fry earned his Bachelor of Arts in seminary from Nebraska Wesleyan University and his Master of Arts in philosophy and theology at Garret Biblical Institute before returning to school and earning another Master of Arts in philosophy and theology and a doctorate in philosophy from Rensselaer Polytechnic Institute. At the close of his seminary career Fry won the “Kidder Preaching Prize.” Since retirement, he has published three books: A New Vision of God for the 21st Century, The Man of Light, and Wrestling with God.